At the start of the New Year I like to look back at what we have achieved and also set new goals for the year, so I don’t forget this year I’ve captured them on this art journal page – I hope you like it! My background was created using three different colours of Liquitex acrylic paints; these were Christmas Green, Vivid Lime Green and Bright Aqua Green. My first layer of paint was a mixture of Christmas Green and Aqua Green, I covered the whole page using a paintbrush. Then I added patches of all three paints to the page, blending the paints together at the edges so they merged together. Next I used a different stencil to apply each of the paints with a sponge; a diamond stencil for the Christmas Green, a circle stencil for the Lime Green and a hexagon stencil for the Aqua Green. Then I stamped a Script stamp by Kaisercraft using black Archival Ink over the page and added splatters of white DecoArt acrylic paint. I die cut some black card with a geometric design on it, that I had recycled from some cookie packaging, using Tim Holtz Sizzix Wildflower thinlets and stuck them to the page using a Zig Memory System glue pen. Then I stamped some little butterflies onto the page and also onto some white card stock using black Archival Ink. I fussy cut the butterflies out of the card stock and then stuck them over the butterflies that I had stamped on the page. The two sentiment cards are cut from a 12x12in design paper by Kaisercraft; the sentiments seemed perfect as they depict looking back at achievements for 2018 and looking forward at goals for 2019; which I wrote on the reverse of each card. As I wanted them to be easily removed so I could look at the information I had written on the reverse, they are attached to the page using some photo corners which I coloured black using a Faber-Castell Big Brush marker (grin!). Looking back, I have lots to be thankful for during 2018 which includes celebrating significant milestones like my birthday and our Wedding Anniversary, getting things done like our garden renovations, making new friends and meeting up with old friends like on our trip to America. 2018 has been a really special year for me with regards to blogging too as I was lucky enough to join the amazing Design Team at Try it on Tuesday, as well as hosting and guest designing at different Blog Challenges and making some wonderful new friends along the way – I had so much fun, and if you are interested you can find all my blogging awards and achievements here. A big thank you to everyone involved in making 2018 so special! I definitely found the sentiment “I’ll look back on this & smile” to be true! I’m sure 2019 will be as much fun and as always I’ll be sharing these moments with you on my blog throughout the year as I capture them on my art journal pages, so I’m looking forward to fulfilling the sentiment “Smile, Laugh, Love, Live, Grow, Happy Today”. Wishing you all the very best for 2019 too! I’m pleased to join the lovely Alison/Craftytrog and the Geometric Shapes challenge over at Art Journal Journey with the different geometric shapes that can be found stencilled in the background and within the papers I used to create this page. As it’s a new start to the year, I’m pleased to be able to join a new challenge blog today; over at Mix It Up Challenge Blog, their theme is Anything Goes + optional twist of Sentiment As Main Focus so I’m joining in the fun with my art journal page (grin!). I’m happy to join the Put Your Stamp On It challenge over at A Vintage Journey as I used stamps in the background and for the pretty butterflies on this page; I was inspired by the New Year to capture my goals and create my Art Journaling style page. I’m pleased to join the “New” (Fresh Start) challenge over at Paperbabe Stamps as my page was created to capture Smiles of 2018 and my New Year Goals for the coming year (grin!). I’m joining in the Let’s Party! challenge over at Simon Says Stamp Monday Challenge as my page celebrates past achievements and looks forward to 2019! I’m also joining Simon Says Stamp Wednesday Challenge and their Something New challenge as I used new design paper from Kaisercraft to create this page. Over at The Artistic Stamper, their challenge is Anything Goes, so I’m pleased to join this challenge too as my page fits their criteria of matching the theme and including stamping too. This week we have had family staying over, so we have been on journeys, travelled to destinations and had a few adventures along the way too (grin!). So I created this page to remember their visit and capture our time together; the background depicts the ripples of the water at high tide on our walks, the car reminds me of our outing to a local car show, the natural colours and pretty flower serves as a reminder of all the nature we saw on our walks as we walked their dog three times a day, and then the maps, clocks, compass and postage stamps to remember our days out and adventures exploring new places. I started by applying Pébéo white gesso with a brayer and then I added dots of black DecoArt acrylic paint and also Bright Aqua Green Heavy Body Liquitex paint over the top and used the brayer to create the wonderful texture. When the paint was dry, I stencilled a large clock on the right-hand side of the page using black Archival Ink and a blending tool. I stamped some Vintage Circles from Woodware Craft Collection using black Archival Ink and then I applied Rusty Hinge and Ground Espresso Distress Ink through a stencil by Andy Skinner using a blending tool. The white circles are stamped using a cardboard tube and white DecoArt acrylic paint, I used the Andy Skinner stencil and Distress Inks again to pattern the inside of the circles and defined the edges more using a white Uniball gel pen and a black Uni Pin marker. Next I added three pieces of washi tape horizontally across the page and then stamped lots of different images using black Archival Ink onto some paper from American Crafts. The stamped images included: some postage stamps, lace and a clock from Kaisercraft; a car stamp from Tim Holtz which I cut up to produce the car, bingo sheet, map and ruler; a patterned circle from Kaisercraft; a compass by Graphic 45 from Hampton Art; a hand pointing the way from a Steampunk stamp set from Docrafts; and some numbers from a Collage Number stamp from Gummpanian Stamps. I fussy cut all the stamped pieces out, edged them with Rusty Hinge and Ground Espresso Distress Ink and then a black Faber-Castell Big Brush marker. They are stuck to the page using a glue stick and Liquitex matte gel medium. Once the glue was dry, I edged them with a black Uni Pin marker and added white detail to both the images and stamping in the background using a Uniball gel pen. Next I cut a wildflower out of white cardstock using a die cut by Tim Holtz from Sizzix and my big shot machine, stuck it in place and outlined it using a black Uni Pin marker. I added two Small Talk stickers from Tim Holtz idea-ology collection which read “the journey is the destination” and also “and so the adventure begins”, again they are outlined using a black Uni Pin marker. To finish, I added some Pébéo white gesso using a palette knife through a Vintage Diamond stencil from Creative Expressions. Last Sunday we went to a Vintage Car Show with our visitors. It is a local show and was held on the green by the beach just round the corner from our house. We saw some beautiful cars including this one which is an Austin and looks a bit like the one on my page (grin!). There were so many different cars there and we liked this one which was originally from Canada. Or maybe this is more to your liking, it’s a Wolseley and I’m not sure my hubby would fit in it (grin!). Some cars are Vintage now, even though I remember them whilst growing up … does that mean I’m getting old (double grin!). VW Beetles for example and we often see this gold one driving around town and look at the kettle and mugs, just right for T Stands for Tuesday! Then we have local car clubs like this Land Rover Club which I thought Yvonne from Meggy’s way may like (triple grin!). It turned into quite the adventure as we also saw the high tide which we don’t see that often and some kitesurfers right next to the beach. I’m pleased to join the lovely Yvonne from Meggy’s way, who is hosting A World of Fantasy challenge over at Art Journal Journey with my Journey, Destination and Adventure art journal page. As I included circles on this page, I’m also joining the Going Round & Round challenge over at The Artistic Stamper too. I used 3 different stencils on this art journal page, so I’m also joining in the fun over at Simon Says Stamp Monday Challenge and there Use More Than One Stencil challenge. Over at Country View Challenges their challenge is Planes, Trains & Automobiles so I’m pleased to join them with the car and journey art journal page. With the quote and all the stamping I used to create this page I’m also joining Fashionable Stamping Challenges and their Quote Away challenge. As I used quite a few Tim Holtz products to create this page I thought of A Vintage Journey, so I’m pleased to join their Back To Nature challenge this month as I was inspired by the nature we saw on our walks so included the natural colours and pretty flower on my Art Journaling and Vintage style page. This page is influenced by Street Art and childhood! 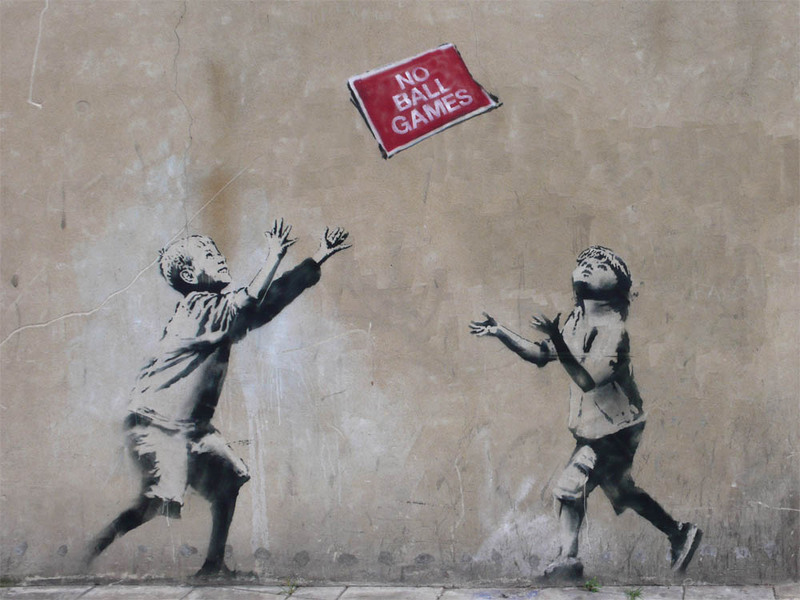 You may recognise the “No ball games” images that I used as part of my design; they are from a Banksy artwork which can be found in Bristol. This image came from a magazine and I thought it would be fun to create a page using it as we had recently seen some amazing street art in Blackpool (grin!). As this page links to childhood, it is also a reminder that there is still a week left to join our Childhood challenge over at Try it on Tuesday too, it would be great to see you there! I started by spraying After Midnight Dylusions Spray Ink onto the page and pulling the ink with a metal tool out from the centre to create spikes of colour so the circles look like they are moving round. Next I picked up some of the Dylusions Spray using a blending tool and applied it along the edges of the page creating a border. I also splattered the page and drew some blue dots using a paintbrush with the spray, then I coloured the centre of the dots using a dark blue and a white Uni Posca paint pen. When the spray was dry, I added the green squares using a stencil from Creative Expressions and Vivid Lime Green Liquitex Heavy Body acrylic paint which I applied with a palette knife and then left to dry overnight. Next I stamped an alphabet stamp from Kaisercraft onto the page to link the blue areas that I had covered with the spray using black Archival Ink. I ripped the Banksy magazine image into pieces and stuck them onto some recycled white card using Liquitex matte gel medium; I did this because I wanted to frame the images so they stood out more from the background and also to prevent the Dylusions Spray Ink which reactivates when wet seeping into the image. When the gel medium was dry, I ripped the white card leaving a border around the image and stuck them onto the page using a UHU Stic, then I outlined them all using a black Faber-Castell Big Brush marker and also a white Uni Posca paint pen which activated the Dylusions Spray Ink and turned light blue which I like. The green balls are created from the leftover green background from the Banksy magazine image; I stamped the circles using black Archival Ink and the spray bottle lid and then cut them out of the paper. I stamped some Titanium White Liquitex Ink onto the page using the spray bottle lid to create a border for the green circles which I stuck in place using a UHU Stic. To finish, I stamped black Archival Ink over the top of the green circles again to define the outline and added further detail using a white Uni Posca paint pen and a black Uni Pin marker. When I think of street art, Banksy always springs to mind, I love his pieces! Banksy is known for his controversial, and often politically themed, stencilled work and this particular one makes me smile as it challenges the status quo and could even encourage children to play ball games despite the sign. The signage was introduced in housing estates built after the war to discourage anti-social behaviour; however they are now often ignored and have been removed as they are not deemed appropriate in today’s society. I’m sharing some more street art from Blackpool that can be found on the side of the Winter Gardens, you may remember me showing other art murals on a previous post that are displayed alongside these. I love these two particular images the first one is of the beautiful owl and …. Did you notice the takeaway coffee cup on one of the photos? It’s on the last one just sticking out of the cardboard box (grin! ), so as T Stands for Tuesday I’m joining the rest of the T Gang and wishing you all a Happy T day! I’m pleased to join the lovely Yvonne from Meggy’s way, who is hosting A World of Fantasy challenge over at Art Journal Journey with my No ball games street art page. With my circles and dots going round and round, I’m also joining the Going Round & Round challenge over at The Artistic Stamper too.